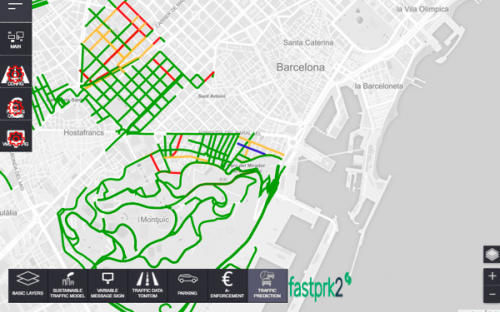 The project consisted in the improvement of pre-existing services and the creation of those that were not yet developed by the Fastprk2 system and its integration with Mobility. Services are divided into two categories, configuration (left part of the control panel) and information (bottom part). Configuration of traffic sections. An integration with the TomTom API has been done to obtain the sections and the traffic data and with the Google APIs to obtain the names of the streets. 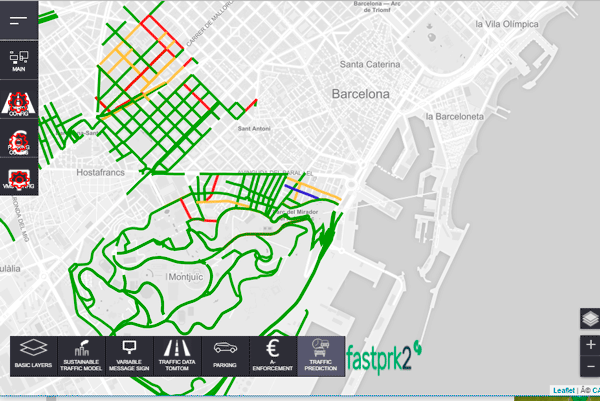 Configuration of the way in which the parkings managed by the FastPark2 platform are visualized. Configuration of the information panels by placing them on the map and managing the information displayed. Environmental sensors The API d'Airvisual has been integrated in order to be able to visualize the measurements of the sensors of different cities and their evolution during the last month. Parking incidents. Through APIs, we consult the free spaces, the occupied ones, the ones that have been paid for and those that have not, to indicate to the parking responsible if there is any type of incident. Parking spaces. Through various APIs, we consult the free spaces of each parking, an occupation history and a graph with the prediction of how the car park will be occupied. It has also implemented a feature called "dynamic price" that allows you to adjust the parking price based on your occupation. Traffic prediction data. The traffic prediction of each of the sections at a given time is displayed. You can also visualize the evolution of the speed in that section during the last week, the expectation of that section during the next hour, the average speed of that section, etc. All these services have been implemented through a Microservices architecture based on docker containers. The client has a functional pilot that will be put into operation in different European cities with an architecture based on instances designed to scale easily.